The second wedding beer I brewed is a tweaked re-brew of a Robust Porter I brewed back in April 2014, hence the 2.0 designation. We decided to call it Plummer’s Porter as a homage to the place Rebecca and I met, Engineering Faculty at the University of Waterloo. Engineering students call themselves Plummer’s (intentionally misspelled). I believe it came out of embracing some name calling between Waterloo and University of Toronto several decades ago, something about us not being real engineers at the time, who knows. A perfect kettle trub cone after the whirlpool. This post I am going to try to give a short insight to my recipe creation and tweaking process. This recipe is a tweaked version of the original recipe I brewed. When I am looking to brew a beer style that I never have before I start by going to the BJCP guidelines to get an understanding of the style and the main flavours and aromas associated with it. In this case, the key points of Robust Porter are all about the malt. There should be a noticeable roasty aroma accompanied by some supporting malt aromas. The flavour should feature lightly burnt black malt character with everything else supporting and balancing that. With that in mind I start to do some research by looking at some well established recipes. Usually that starts with Brewing Classic Styles (BCS) and then I also look at some well regarded clone recipes of classic examples of the style. For version 1.0 of this beer I ended up adapting Jamil’s Robust Porter recipe to my system volumes and efficiencies. I hadn’t brewed an imperial stout before so I decided to look for inspiration from some of my favourite examples. 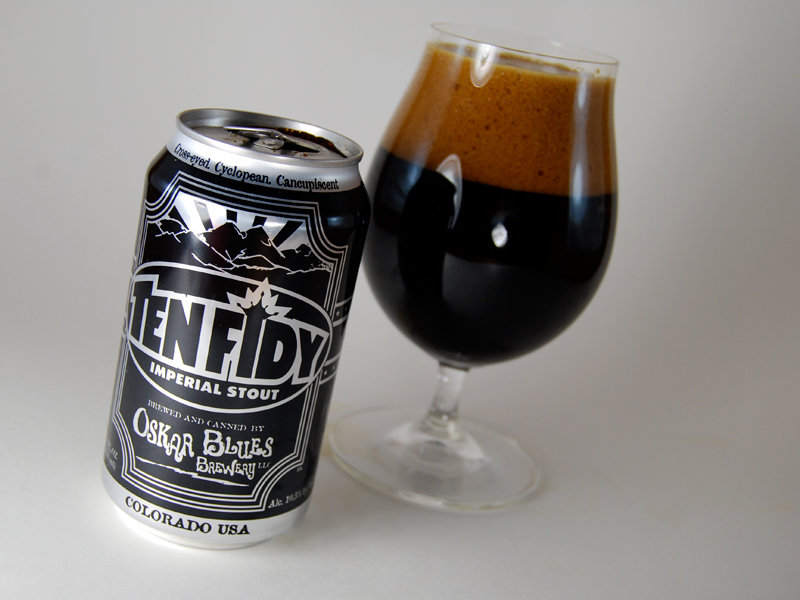 One RIS I really enjoy is Oscar Blues Ten Fidy, with mysterious opaque black colour and intense roast profile. It also happens to be brewed near Denver, Co, where Rebecca and I are going for our honeymoon in February. I did a bit of research and found that someone had made a homebrew recipe with the help of the brewer. I was a bit skeptical because the Oscar Blues website doesn’t mention crystal malt in the recipe, only 2 row/chocolate/roasted barley/flaked oats. I decided to brew it anyway. 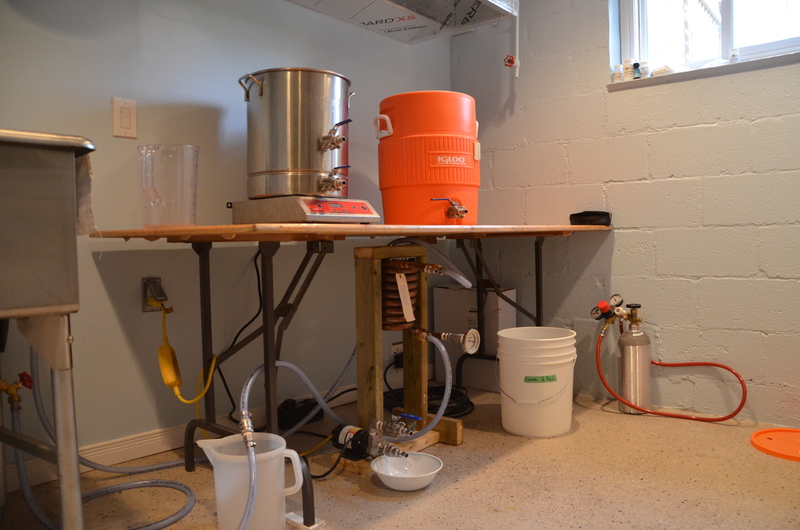 Before I start posting about recipes and brew days I thought it would be a good idea to start with a post about my setup and an explanation of how I do things at a high level. In the interest of making this post digestible I am going to skip over some of the details and explain them as I go. 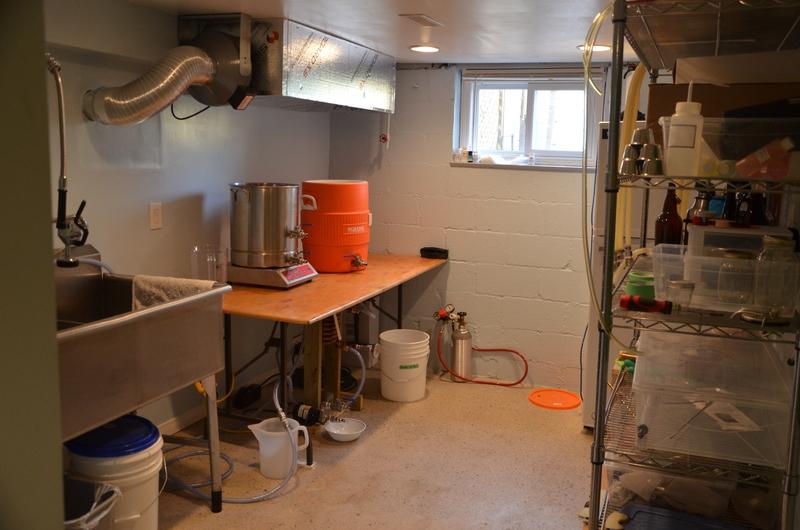 First thing’s first, here is my brewery (image below). My favourite thing about it is that I can leave it set up, which saves considerable time on brew day. The heart of my brewery is a 10 gallon stainless kettle (Bayou Classic 1040) and a 10 gallon Igloo cooler with false bottom. My setup is very similar to most people’s turkey fryer and cooler setup, I batch sparge in a cooler, and boil in a 10 gallon kettle. The kettle is heated by a 3500W induction cooktop (Avantco 3500) which is plugged into a 40 A stove outlet (via a custom adapter cord). I have a vent hood to allow steam to escape during the boil, powered by a Vortex VTX600 fan capable of 452 CFM. There is also a stainless sink (from kijiji) and pre rinse faucet to wash up, and few other things I’ll get around to explaining over time. A glimpse into the brewery. Under the brew table you can see my pump and chiller setup. My kettle has two valves so that I can whirlpool while chilling. When chilling a non-hoppy beer, I hook up my hoses, knockout at the 0 min mark, then kick on the pump to recirculate boiling wort through the chiller. When the output of the chiller reads above 180*F I turn on the chilling water and recirculate until the output of the chiller matches my pitching temp. Though I usually need to chill further in my fermentation chamber for lagers. A closer look at the brew stand. 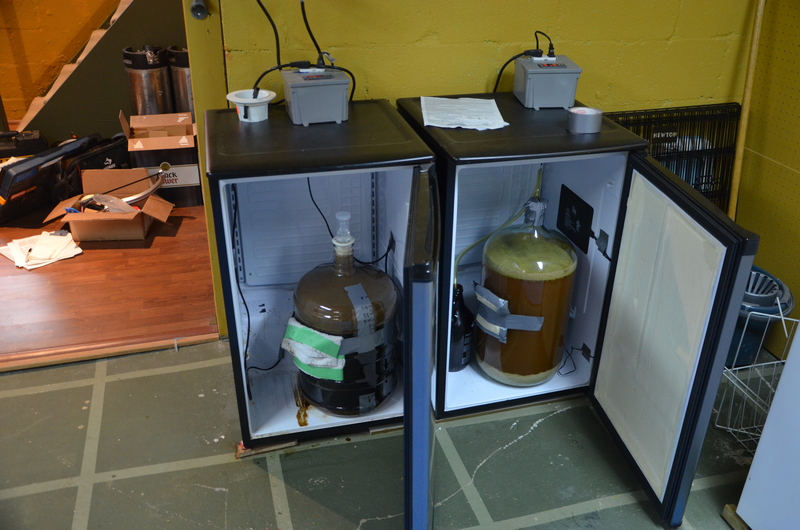 I am a big believer in precise fermentation control so I have dedicated two mini fridges to the cause. Each batch is independently controlled and can be heated and cooled. I usually pitch lower than fermentation temperature, hold at target temperature, then ramp up towards the low 70’s. As you can see they comfortably fit 6 gallon carboys, these are the 4.5 cu ft Danby models. 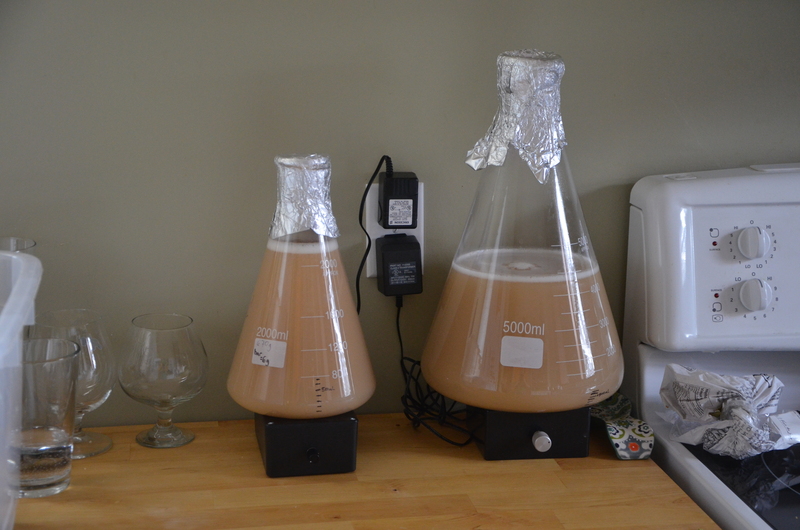 My two fermentation chambers. Imperial Stout on the left and Brett IPA on the right. My fridge and shelf don’t need much explanation. My fridge holds harvested yeast and beer, and the freezer compartment holds vacuum sealed hops. I always make my starters larger than needed so that I can save some for the next batch. This way I can avoid mixing my harvested yeast with hop solids and excess protein. The brew shelf holds pretty much everything I haven’t found a nice spot for in my brewery. Empty fermentors are stored on the first two shelves, I use Better Bottles as much as I can. Empty growlers and swing tops, oxygen wand/tank, keg parts, pH meter and calibration solutions, it’s all on there. Brew shelf and brew fridge. The shelf could be better organized but it does the job. Two starters going. A 2L on the left of WLP090 for a Robust Porter, a 4.5L of WLP833 on the right for a Doppelbock. 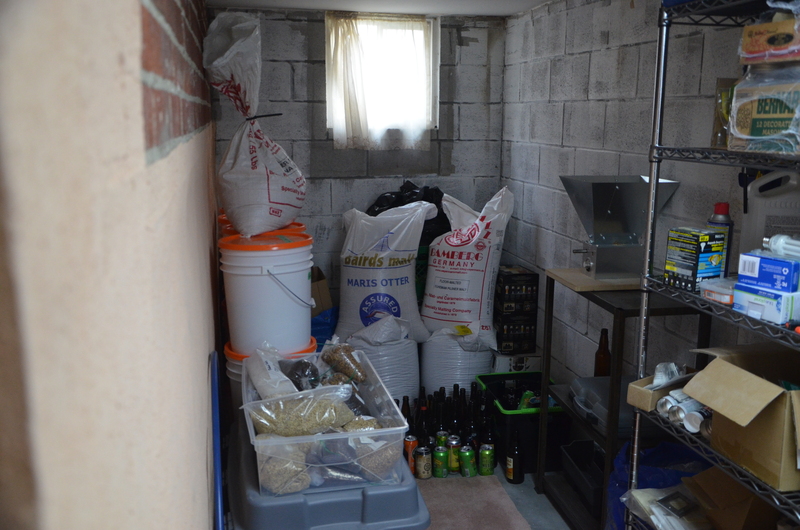 I store and mill my grain at the opposite end of the basement, in the cold room. 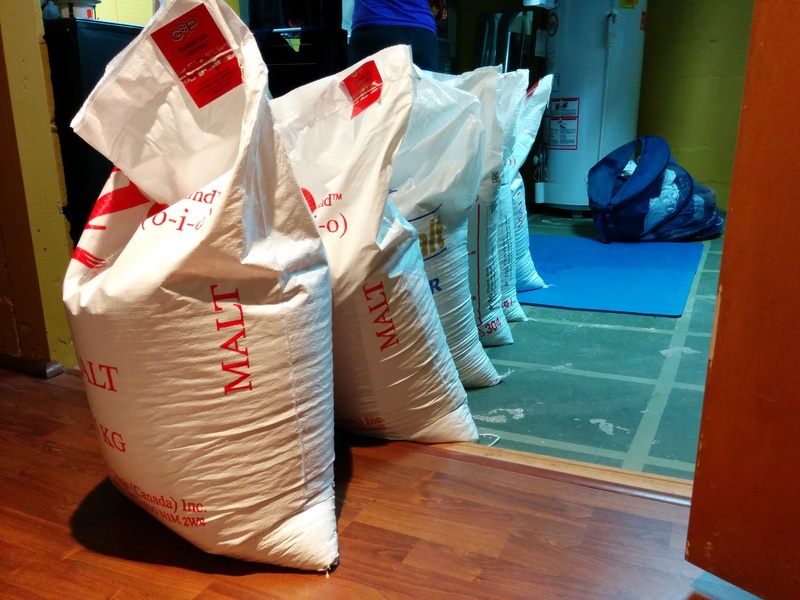 I buy full sacks of grain through bulk buys run by a regional homebrew club. Keeps the costs down per batch, and allows me to have lots of grain options for when the inspiration strikes. Once a sack is opened I pour it into a pair of buckets. I like to think this is better than storing an open sack since there is a better seal, plus they stack nicely to reduce the footprint. My mill is a Monster MM3-2.0, recently acquired, but I am definitely loving it so far. I usually store my extra full sacks in the grey rubbermaid but I have an extra few sacks right now since the fall bulk buy just happened last weekend. Not pictured is a 75 lb capacity blade scale that I use to measure out grain bills, and a 1/2″ drive corded drill to run the mill. Also, my empties box is overflowing, I should probably work on returning those to the much hated recycling center, aka The Beer Store. Mill and grain storage in the cold room. In the room next to the brewery I have my keezer and bottling station. I store my empty kegs next to the keezer, and also my carboys being used for long term aging (current a sour stout and a cider). 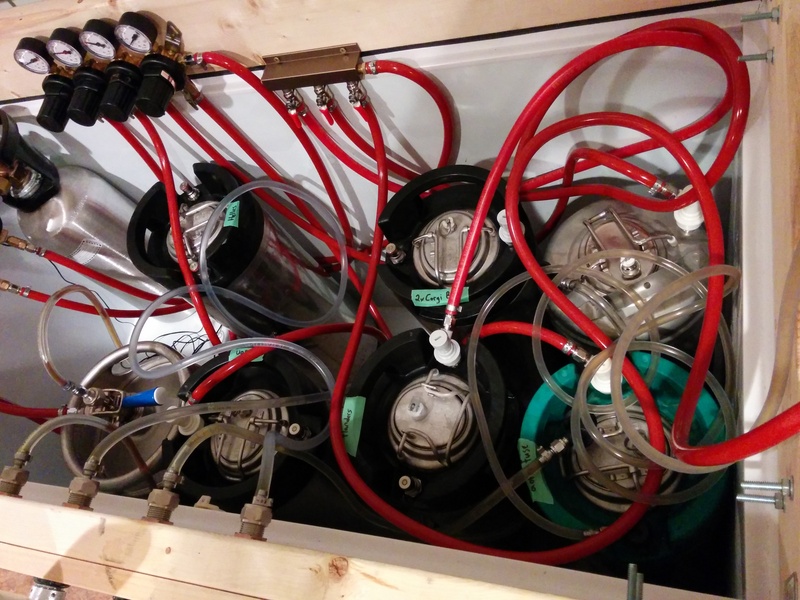 The keezer itself can fit approximately 11 corny kegs, though I haven’t tried yet. It has a 4 output secondary regulator so I can set unique serving pressures for each keg. I use the mirror behind the keezer as the tap list, writing the beer menu on it using window marker. 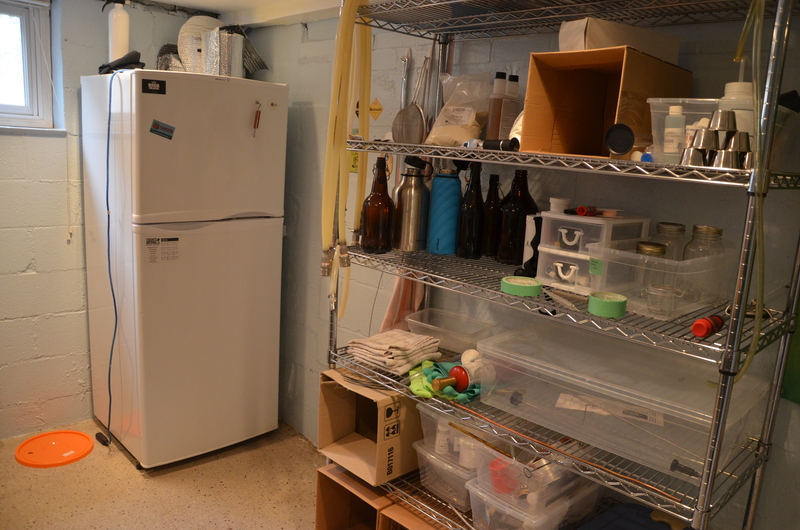 The bottling station is currently just a wobbly shelf that hold my vinator, beer gun, and other bottling accessories. 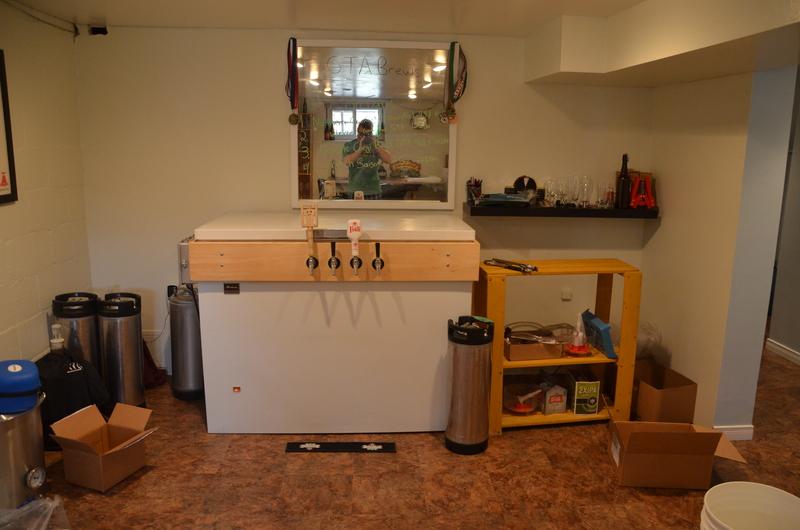 Keezer and bottling station in the room adjacent to the brewery. Thanks for reading, if you have any questions about my setup please don’t hesitate to ask them in the comments below! I’ll be sure to elaborate on the more important parts in future posts about brew days. 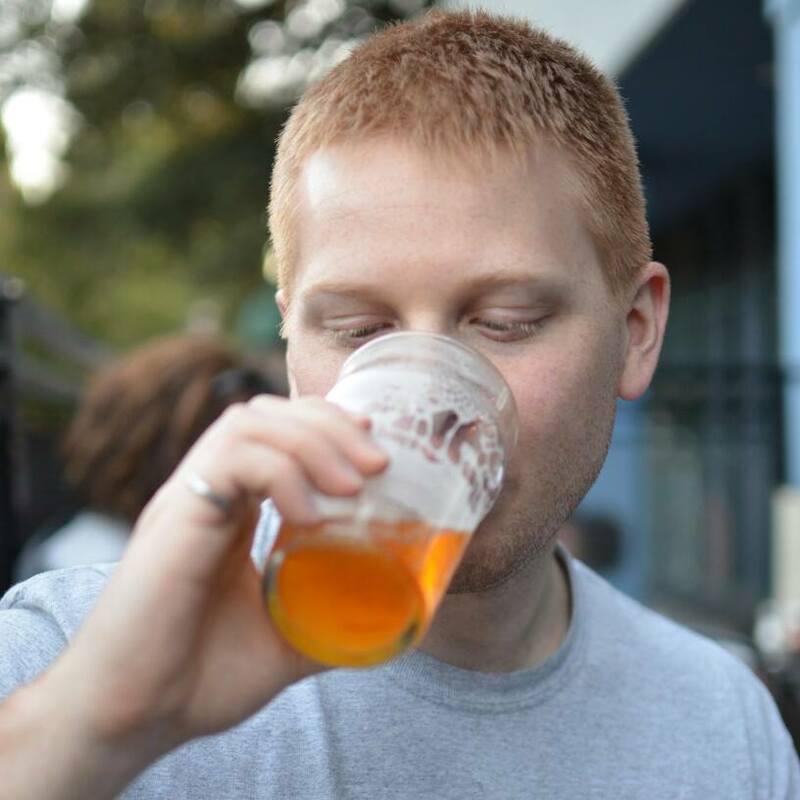 Hi my name is Eric and welcome to my brewing blog! I don’t have much here yet but I have several busy months of brewing ahead of me in a bid to make more than a dozen kegs of unique homebrewed beers for my wedding at the end of January. I’m pretty much going to be brewing twice a week for the next two months so I thought what better time to start a blog than when I am neck deep in brew scheduling and planning. I don’t have much experience with blog writing so please bare with me as I learn. When it comes to planning out beers to serve at a wedding as a homebrewer it is very tempting to go nuts and pick some of the most out there recipes, and at the same time it is tempting to play it super safe and brew beers you know can be enjoyed by more than just your beer nerd buddies. My fiancee Rebecca and I tried to play it down the center when planning out the beer list. We’ve settled on a wide array of styles including easy drinking beers like Munich Helles (description below), and some more beer geek centric styles like Russian Imperial Stout and Brett IPA. Full mash tun while brewing the Russian Imperial Stout for my wedding. 28.25 lbs of grain for a 6 gallon batch. IPA#2 – Another dry hopped, hoppy ale with focus on citrus, tropical, and pine aromas. No hop combo planned yet. 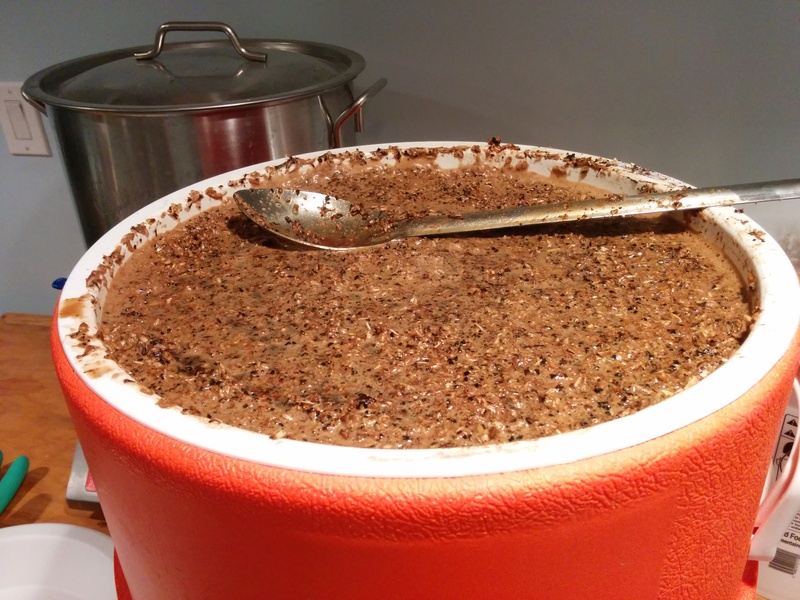 Imperial Stout – Already brewed this one. Took inspiration from one of my favourite examples of the style, Oscar Blue’s Ten Fidy. Which happens to be brewed near where we are going for our honeymoon. This one will be north of 10% ABV and hugely roasty. American Pale Ale (APA) – This one may also focus on a single hop. Lower ABV than the IPAs, and more balanced with the malt. Saison – A style experience resurgence in the homebrewing community due to it’s delicious nature and forgiving fermentation temperature schedule. Another effervescent ale of Belgian origin that finishes very dry and fruity. May be appealing to wine drinkers. Hoping I can brew this outside of my fermentation chambers (which are going to be the main limiter in my brewing schedule). Session English Ale – I haven’t decided on the style for this one yet but I want something lower ABV (under 4%) and malty. Going to be one of: Ordinary Bitter, Mild, or Scottish 60/-. Cider – Something for the non-beer drinkers. Made with local Ontario cider, fermented by me. Probably a dry or semi-dry cider, not a big fan of sweet cloying ciders. Doppelbock – One of my favourite styles, an intensely malty german lager with a warming feeling due to the high ABV. I won a few awards this year with my Doppelbock so I am going to re-brew it with some tweaks. This is going to be brewed as early as possible to ensure adequate lagering time (cold storage), which is a traditional way to clarify lagers. 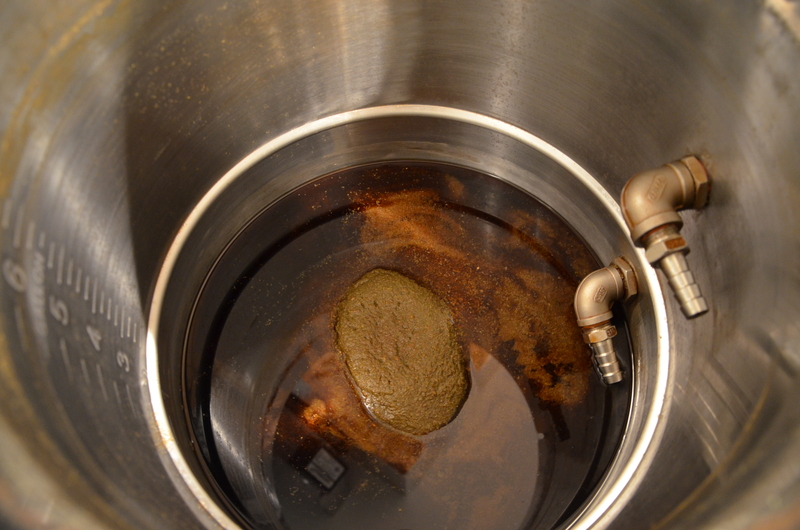 Northern Brown Ale – No big plans for this one, may be subject to change, but something middle of the road. I have one on tap now that is drinking very nicely. Session IPA – A low ABV (<5%) variant of the IPA style. Similar hopping levels, but less alcohol and a tweaked balance. Really just a hopped up APA. Brett IPA – I have one of these in the fermenter right now that is slated for the GTA Brews (my local homebrew club) advent calendar exchange. If it turns out well I may do something similar for the wedding. Thinking some Galaxy and Mosaic/Simcoe for this one. Six bags of grain. Some of it slated to become some of these wedding brews! There are a lot of beers in the works and I’m hoping to chronicle the making of each one on this blog. Not all of them will make it into the wedding, my goal is to brew more than needed and handpick the best ones to increase the overall quality delivered. I also have a few DIY projects slated for the upcoming months (and a few recently completed) that will be documented on this blog so stay tuned! I’m sure the journey will be an exciting (and tiring) one.